These Terms & Conditions govern your use of this site and constitute the agreement between you and Euro Resort Investments Ltd (C28576). By using, viewing, transmitting, caching storing and/or otherwise utilising this website, the services or functions offered hereon and/or the contents and information on this site, you agree to each and all of the terms and conditions set forth below, and waive any right to claim ambiguity or error on this Agreement. Should you not agree to each and every term and condition set out herein, you are asked not to use this website and to leave immediately. Periodic or continued users of this website are reminded that website usage following the posting of changes, updating or amendments to this Agreement from to time will imply that such changes or amendments are accepted by you. The website www.marineparkmalta.com is owned and operated by Euro Resort Investments Ltd, a company registered in Malta with Company Registration No C28576. Euro Resort Investments Ltd is authorised by the Malta Tourism Authority to act as an Incoming Travel Operator under licence no TRA/E33. Euro Resort investments Ltd are authorised agents for the Meditteraneo Marine Park. Our Registered Office is No 1, Ivy Mansions, Triq Il Qasam, Swieqi. SWQ3026. We may be contacted on Telephone Number 356 21 678781 or via Email. When you fill in the Book Online Form we use the personal information submitted in the form only to respond OR to book your Marine Park Booking request. In order to process your booking, we need to collect certain personal details from you. These details will usually include the names and addresses of the leading party member, credit/debit card or other payment details and special requirements. This personal information is not to be kept longer than necessary. It is important to note that the forms displayed on this website and the information required may vary from one service to the other. Failure to enter the information requested in the forms displayed on this website will result in either the form not being submitted or not allowing us to process your request. This site may provide you with the ability to use user names, passwords, or other codes or devices to gain access to restricted portions of this site (“access codes”). The content contained in such restricted areas is confidential to Euro Resort Investments Ltd, and is provided to you for your sole use only. Access codes are non-transferable, and Euro Resort Investments Ltd reserves the right to prohibit and/or suspend the use of such access codes on your behalf by third parties at Euro Resort Investments Ltd discretion, and/or where we determine that such use interferes with our website’s operation. You agree that you will not use any device, software or other instrumentality to interfere or attempt to interfere with the proper working of our site, and that you will not take any action that imposes an unreasonable or disproportionately large load on our infrastructure. In addition, you agree that you will not use any robot, spider, other automatic device, or manual process to monitor or copy our web pages or the content contained herein, without the prior express consent from an authorised Euro Resort Investment Ltd representative (such consent is deemed given for standard search engine technology employed by Internet search web sites to direct Internet users to this website site). The photographic images displayed on this web site have been taken by representatives of Euro Resort Investments Ltd or purchased from any other service provider with their full consent. All photos are therefore protected by copyright and other intellectual property laws. You may not copy, reproduce or retransmit these photos, in whole or in part, in any manner, without the prior written consent of Euro Resort Investments Ltd or the relevant third party. All Prices quoted on this website are in EURO. You must book in accordance with the booking information provided to you by one of our representatives, or automatically on this website. The information and requirements contained in our booking forms and on our website form part of your contract. If we have given you a quotation for a booking for a Day Show Block Ticket, Dolphin Interactive Programme Ticket, Sea Lion Interactive Programme Ticket, Parrot Interactive Programme Ticket, Swim With Dolphins Ticket, Spectator Ticket or Transport Ticket featured on our website, please note that such a quotation does not constitute a binding contract between us and will not be confirmed until an email voucher is issued by us or automatically from our website. Booking/email vouchers are only valid if the relative payment for one or more Day Show Block Ticket/s, Dolphin Interactive Programme Ticket/s, Sea Lion Interactive Programme Ticket/s, Parrot Interactive Programme Ticket/s, Swim With Dolphins Ticket/s, Spectator Ticket/s or Transport Ticket/s as displayed on our website have been paid in full in advance. In the event of discrepancies between the number of ticket/s paid for and the number of person/s shown on the Booking/email vouchers or the number of person/s in your party who attend the Park you accept to pay/be charged the difference in price by using the same method of payment used for the original booking. All bookings effected through this website attract a booking fee per ticket depending on the selected event/date, this will be displayed on the booking form. All bookings are subject to availability. Depending on the method of payment you have used to settle any payments with Euro Resort Investments Ltd, there may be an additional charge levied to cover bank charges that will be added to the total amount payable to Euro Resort Investments Ltd.
A binding contract between you and Euro Resort Investments Ltd on behalf of the service provider will come into existence after completion of the booking process i.e. upon receipt of full payment and once the booking voucher has been issued. All parties agree that this contract is deemed to have been made at the Malta offices of Euro Resort Investments Ltd and that you have accepted in full the Terms & Conditions detailed herein. (c) ‘Force majeure’. In these booking conditions ‘force majeure’ means any event which we, the service provider or other supplier(s) of the service(s) in question could not, even with all due care and diligence, foresee or avoid. Such events may include adverse weather conditions, water restrictions, war, threat of war, civil strife, industrial action, natural or nuclear disaster, fire, epidemics, terrorism, road accidents, Acts of God, closure of ports, governmental action and all other events outside our/their control. (d) Euro Resort Investments Ltd cannot accept responsibility for any services which do not form part of your contract. This includes, for example, any additional services or facilities which the service provider/supplier of the services in question agrees to provide for you where the services or facilities are not advertised in our website and we have not agreed to arrange them. A full list of the lead traveller and number of persons must be provided at the time of booking. We regret that we, and the service providers/suppliers cannot accept liability or pay any compensation where the performance or prompt performance of our respective contractual obligations is prevented or affected by, or you otherwise suffer any damage or loss as a result of ‘force majeure’. You are recommended to take up personal Insurance before travelling to Malta. It is your responsibility to ensure that the insurance cover that you purchase is adequate for your particular needs as well as personal liability for all travellers in your party. Euro Resort Investments Ltd will not be held responsible for any claims arising during your holiday or when using our services in the Maltese Islands and we reserve the right to request proof of your insurance at any time. 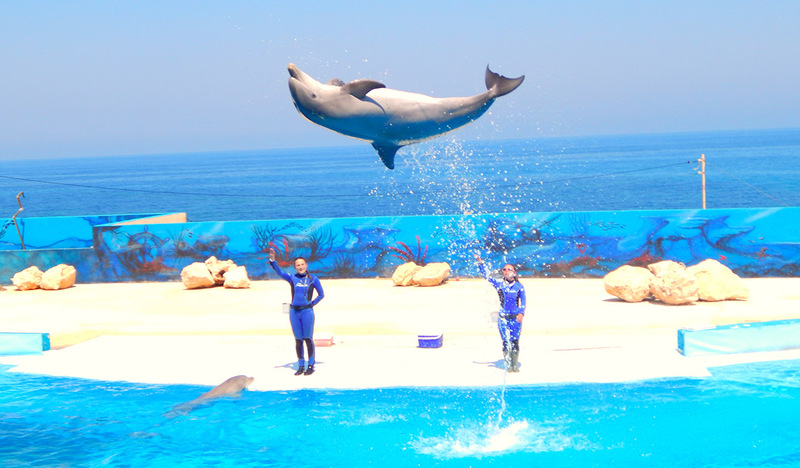 (a) Adults are considered to be persons between the Age of 13 and 65 for Day Show Block Tickets, Interactive Programme Tickets, Swim With Dolphins Tickets and Swim With Dolphins Spectator Tickets. (b) Children are considered to be persons between the Age of 4 and 12 for Day Show Block Tickets & and Swim With DolphinsSpectator Tickets. BUT between the Age of 8 and 12 for Swim With Dolphins Tickets. i.e Children below the Age of 8 will NOT be allowed to Swim With Dolphins AND between the Age of 6 and 12 for the Interactive Programme Tickets i.e Children below the Age of 6 will NOT be allowed to particpate in Interactive Programmes. (c) Infants are considered to be persons between the Age of 0 and 3 for Day Show Block Tickets and Swim With Dolphins SpectatorTickets and will be allowed FREE ENTRANCE to the Park. HOWEVER Infants will NOT be allowed to purchase Swim With Dolphins Tickets and/or Interactive Programme Tickets. Day Show Block Tickets must be purchased in advance. The Parrot Show Presentation; The Sealion Show Presentation; The Dolphin Show Presentation; The Reptile House. Note: Show times may vary between seasons. Swim With Dolphins & Spectator Tickets must be purchased in advance. (a) A Swim With Dolphins Ticket will entitle the ticket holder entrance to the Marine Park, Free Entrance To All Shows, & A Swim With Dolphins. (b) A Spectator Ticket will entitle the ticket holder entrance to the Marine Park, Free Entrance To All Shows and a Spectator Ticket. (c) Although you would have booked for a particular date, the actual swim time is subject to confirmation by us, as each swim is limited to a maximum group size of 10 persons. (d) Swim start times may vary slightly at the discretion of the Marine Park management. (e) A Swim With Dolphins Ticket entitles the ticket holder to only 1 swim. (f) Swim With Dolphins bookings are subject to the Swim With Dolphins Disclaimer. All types of Interactive Programme Tickets must be purchased in advance. (a) All types of Interactive Programme Tickets will entitle the ticket holder entrance to the Marine Park, Free Entrance To All Shows, & the chosen Interactive Programme. (b) Although you would have booked for a particular date, the actual Interactive Programme time is subject to confirmation by us, as each Programme may be limited to a maximum group size. (d) All types of Interactive Programmes start times may vary slightly at the discretion of the Marine Park management. (e) All types of Interactive Programme Tickets entitles the ticket holder to only 1 Interactive Programme. Transport is only available from Hotels in Malta and NO other pick up point may be requested. Transport is available whether you wish to book a Day Show Block Ticket, a Swim With Dolphins Ticket or Spectator Ticket, a Dolphin Interactive Programme Ticket/s, a Sea Lion Interactive Programme Ticket/s, a Parrot Interactive Programme Ticket/s at an additional charge per per person. If you require Transport to the Marine Park you have to select this at the time of booking, otherwise it will be assumed that you will be making your own way to the Marine Park. Whether you have booked a Day Show Block Ticket or a Swim With Dolphins Ticket or an Interactive Programme ticket, the Park’s Mini Van will collect you from your Hotel at a time specified by us/the park, however as a general rule the Park Vans collect guests between 0830hrs and 0945hrs in the morning. Should you or any other member of your party need to cancel your booking, cancellation charges will be levied and will be payable as detailed below. Please note, cancellations can/will only be accepted at least 72 hours (3 days) prior to the booking date, from the party leader, in writing quoting your booking reference and sent to our customer help desk by using our contact us form. Cancellation Requests not following the correct cancellation procedure will incur a penalty of between EUR 20 and the full price paid. Cancellations between 1 and 72 hours as well as NO SHOWS are subject to a 100% cancellation fee. Any requests for cancellations must be received in writing during office hours which are between Monday to Friday from 0900hrs to 1700hrs (CET). Any requests for cancellations that are received on Friday after 1700hrs (CET), all day on Saturdays, all day on Sundays or on Local Public Holidays will be deemed not to have been received by Euro Resort Investments Ltd until the next working day. Any refunds by credit card will carry an additional 3.5% bank charge on the original amount received. Any refunds by bank transfer will carry the relative bank charges. Should you or any other member of your party need to change or modify the dates or number of persons relating to your booking, you may do so subject to availability and at least 72 hours (3 days) prior to the booking date. If it is possible for us to make the amendment we will charge the administration fees detailed below as well as any applicable increase in the price if the amendments relates to a change of date which falls into a higher pricing season or an increase in number of persons booked. Please note, changes may/will only be accepted from the party leader, in writing quoting your booking reference and sent to our customer help desk by using our contact us form. Any requests for changes or modifications to your booking must be received at our office during office hours which are between Monday to Friday from 0900hrs to 1700hrs (CET). Any requests for changes or modifications to your booking that are received on Friday after 1700hrs (CET), all day on Saturdays, all day on Sundays or On Local Public Holidays will be deemed not to have been received by Euro Resort Investments Ltd until the next working day. Any refunds by credit card will carry an additional 3.5% bank charge on the original amount received. Any refunds by bank transfer will carry the relative bank charges. You are responsible for your party’s passports, insurance documents, or Entry Visa To Malta if this is required by Law. In case of difficulty interpreting these Terms & Conditions you may contact us on Telephone Number 356 21 678781 or by Email.